The house of William Sellers & Co. was started in 1848 as Bancroft & Sellers, and so continued until 1855, when upon the death of the senior partner the business passed into the hands of two brothers, William Sellers and John Sellers Jr., who alone constituted the firm until 1873. It was the pioneer in the introduction of the present system of mill-gearing with interchangeable parts, and the manufacture of machinists' tools as a distinct branch of business. When Edward Bancroft died, William, partnered with his brother, John, reorganized Bancroft & Sellers into this firm in 1855. 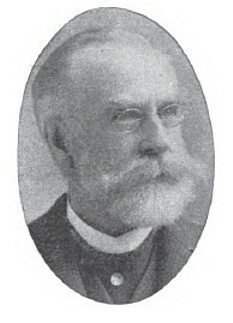 Their cousin, Coleman Sellers, joined the firm in 1856 after having been superintendent at Niles & Co. The focus was on large machine tools for the railroad industry. Sellers built one of the largest lathes ever made in 1892 to turn and bore barrels for the Navy's 16" guns. At the great iron works of William Sellers & Company (Incorporated), Philadelphia, manual skill in a large measure is dispensed with as there arc various machines for turning, planing, shaping, drilling, or boring metal or wood in which the tool or cutting edge is guided in its fixed path by mechanical means. The term "machine tool" in this connection should be understood to include all machines that work or shape metal, as steam hammers, hydraulic forging machines, riveting machines, punching and shearing machines. As a distinct branch of industry, "machine tool " making is of recent date. The first man to attempt the construction of "machine tools" was Mr. Joseph Whitworth, of England. Not long after this Bancroft & Sellers, now William Sellers & Co. (Incorporated), started a similar establishment in this country. They began in 1848 with the making of "machine tools" shafting and mill gearing, their shops being located in Kensington, in 1853 they erected new buildings at Sixteenth and Seventeenth streets, Pennsylvania avenue and Hamilton street, the works taking in the entire block. In 1855, not two years after the occupation of the new works, Mr. Bancroft, the senior partner, died, and the business passed into the hands of William Sellers and John Sellers, Jr., the firm name being William Sellers & Company. The two brothers constituted the firm until 1873, when Coleman Sellers, John Sellers Bancroft and James C. Brooks, who had long been associated in the business were admitted to partnership. In 1870 they removed to new buildings covering more than half the square of ground north of them, all that pertained to the foundry, namely: the pattern shop, pattern storage rooms, and the foundry proper. In addition to the regular business of the house of "machine tool " making, they have for several years been engaged in the manufacture of other necessities of railroads, as turn tables for locomotives, turn tables for pivot bridges, sliding or transfer tables. Their cast iron turn table has been adopted by many of the railroads in the United States, South America and Austral1a, and is in use in Europe. Among the most important of their recent productions arc two high speed power travelling cranes just placed in the new erecting shops of the Baldwin Locomotive Works. Each of these cranes has two 50-ton trolleys, making the total capacity of each crane 100 tons. The machinery is driven by electric motors and the speed of the cranes is as follows: Upon the runway 100 and 200 feet per minute; transversely in the crane bridge 50 and 100 feet per minute; hoisting and lowering 5, 10, 20, and 40 feet per minute; all variable at the will of the operator to any speed between maximum and zero and may be made without shock or jar. This house introduced the Gifford boiler injectors into the United States, and improved it greatly, and is now sending the improved instruments in large quantities to the French railways. The first display of the work of this house in Europe was in Paris in 1867. This they followed by a larger exhibit in Vienna in 1873. In Paris they received the Gold Medal, and in Vienna what is called the Great Diploma of Honor, the highest possible mark of appreciation. The award was to "Sellers for pre-eminent achievements in the invention and construction of 'machine tools,' many of which have been adopted as patterns by the constructors of tools in all countries." With the advent of "machine tools," wooden cog wheels, wooden shafts, and the cumbersome wooden drums gave way to iron pulleys on iron shafts, running in metal boxes. But all those were of clumsy and heavy designs, altogether too heavy, and as they were sold at so much per pound, there was small inducement for the manufacturer to attempt a reducement in weight. The need of a more perfect system of transmission had long occupied the mind of Mr. Edward Bancroft, and at last he designed a form of hanger for shafts which is known as the "ball and socket hanger," and is now in general use throughout the country. It involves a self-adjusting principle in the alignment of the box in relation to the shaft turning in it and ready means of lining up the entire series of shafts, making one continuous line. Oddly enough after this invention was completed, Mr. Bancroft could not induce a single one of the leading manufacturers to take hold of it. On this account the house of Bancroft & Sellers pushed forward to further perfect the manufacture of shafting, and soon became as celebrated for the excellence of their shafting as for their other machines. In fact they turned their attention very particularly to the shafting business and they contrived many ingenious machines in this connection. They 1ntroduced a new form of coupling for uniting the separate pieces of round iron going to make up a line of shafts. This coupling was easily attached and detached, did away with much expensive fitting requiring skilled workmen and allowed the use of a form of hanger with less metal than was ever before possible. It took some time to show the users of hangers that it would be true economy to pay more per pound for a good article, that was honestly strong and would cost less money to keep running and in repair than to buy, at say ten per cent, less per pound, triple the number of pounds costing more coal to run. But eventually this lighter and more efficient shafting was placed upon the market at no greater cost in the aggregate than the other articles. This change was due entirely to the introduction of improved "machine tools." Many hundreds of miles of this improved shafting now drive the cotton and woolen mills of this country, and there are numerous examples of it to be found abroad. In their exhibit in Paris in 1867, and afterwards in Vienna, this new system of shafting was first displayed in Europe. A number of the technical schools of Europe have purchased samples of hangers, couplings, etc., which they have placed in the1r museums. The foreign journals, while enthusiastic over the merits of the hangers and couplings of this firm, declare that in their introduction to Europe, much is due to the establishment of a scale of fixed prices in contradiction of the custom of some other manufacturers, who, selling their goods by weight, would make them inconsistently heavy. For instance, the London Standard says, "The advantages thus arising to the purchasers of the Messrs. Sellers' improved shafting consist not only in a direct saving of first cost by greatly diminished weight, but in the acquisition of a well constructed and smooth running shafting of very neat appearance and as light as is consistent with the required strength. The journal boxes are unusually long and so held in their supports as to always insure a uniform distribution of pressure over the entire length of bearing. In their construction iron is used instead of brass or other soft metal composition." Appended to the report made by the British Commissioners to Parliament on the subject of the Vienna Exhibition, there were a series of technical papers on special sections of the Exhibition contributed by W. W. Maw and James Dredge. Speaking of machine tools they say of the exhibit from the United States, "For the number of machines it included there was in fact no collection of tools in Machinery Hall which could compete for real originality of construction with that found in the American department. Messrs. W. Sellers & Company, of Philadelphia, are well known as the Whit worths of America, and their exhibits well sustained their reputation both for design and excellence of workmanship." One of their machines which attracted perhaps the largest share of attention at the European exhibitions was a peculiar kind of planing machine for metal. It was the invention of Mr. William Sellers and involved an entirely new principle in the method of operating the table. A shaft crossing the bed diagonally has on it a spiral pinion, this pinion engages the teeth of a straight rack and imparts an exceedingly uniform motion to the table with less friction than is common to other methods of driving. This machine has been greatly improved of late years and is now as far in advance of the ordinary constructions of planing machines as the original invention was of the machines then in use. Another of the English journals speaking of the planing machine for metal, said, "The American inventor had in v1ew the construction of a better machine than any now in use and that could be more economically placed in the workshop. The English builder of what purported to be the same character of tool, adapted devices which had been found to work well but ignored all the deviations from existing customs that looked towards a rational change in the placing of tools in the work shop. American mechanics have been obliged to bestir themselves in the world's race. They have had to contend with high wages and a lack of good workmen, they have therefore been forced to exercise their inventive faculties to make machinery that will cheaply and effectively perform the work required to be done, and this house held to be a model in its line, has done its share in this great work by its perfection of the tools required to make these machines." William Sellers & Company (Incorporated) are now engaged among other works in building the large gun lathes for the United States Navy Yard, Washington, for 16 and 14 inch rifled guns. These are not only of the largest that have ever been designed for such uses, but embody features which in the judgment of engineers make them superior to any lathes before produced for modern guns. Many of the machines above mentioned have been recently greatly improved, and there have been added several important tools, among them the tool grinding and shaping machine, and the drill grinding machine with drill pointing attachment. 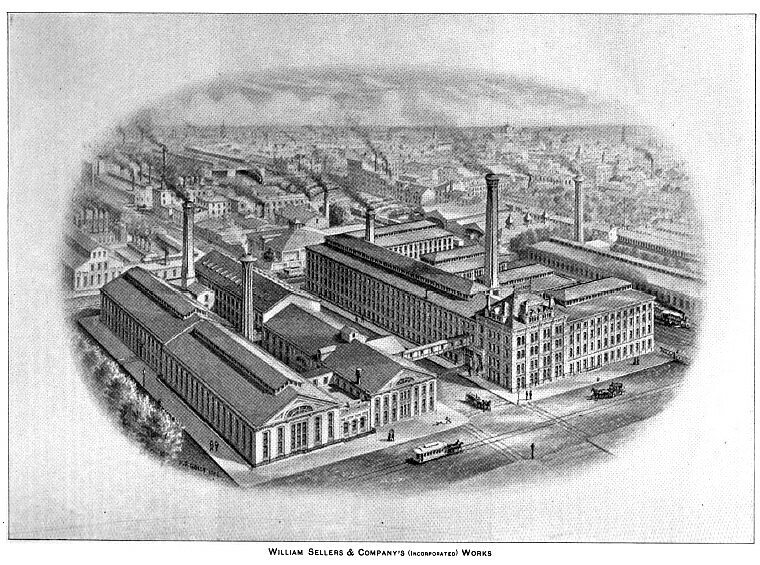 This great industrial works was incorporated in 1886, and is now presided over as follows: William Sellers, president and engineer; John Sellers, Jr., vice-president and treasurer; Justus H. Schwacke, secretary; J. Sellers Bancroft, manager; D. L. Lukens, purchasing agent. Mr. Sellers was born in Upper Darby, Delaware County, Pa., September 19th, 1824. He was educated at a private school maintained by his father and two relatives for the education of their children, and served his apprenticeship at the machinists' trade with his uncle, John Morton Poole, of Wilmington, Delaware, for nearly seven years. In 1845 he took charge of the large machine shop of Fairbanks, Bancroft & Co., in Providence, R. I. In 1848 he commenced the manufacture of machinists' tools and mill gearing in Philadelphia, and subsequently joined Edward Bancroft. The new firm was Bancroft & Sellers. Later John Sellers, Jr., was admitted as a partner, and in 1853 the new shop at 16th Street and Pennsylvania Avenue was occupied. Mr. Bancroft died about 1856, and the firm became William Sellers & Co. Finally, in 1886, the company was incorporated with William Sellers as president. In 1868 he formed the Edgemoor Iron Co., of which he was president. This company furnished all of the iron structural material for the Centennial Exhibition buildings, and also all of the structural material for the Brooklyn Bridge, with the exception of the suspension cables. In 1873 Mr. Sellers became president of the Midvale Steel Co., Nicetown, Philadelphia, Pa., which he reorganized and which under his management became the first successful producer of material required by the Government for its steel cannon. In 1868 he became a member of the Board of Trustees of the University of Pennsylvania, and served continuously until the time of his death. In 1864 Mr. Sellers was elected a member of the Philosophical Society, and in 1873 became a member of the Academy of Natural Sciences; he was a member of the Institute of Mechanical Engineers of Great Britain, the Iron and Steel Institute of Great Britain, a corresponding member of the Societe d'Encouragement pour L'Industrie Rationale, in Paris, and at the close of the Paris Exposition, in 1899, the decoration of Chevalier de la Legion d'Honneur was conferred upon him. He was also a member of the American Society of Civil Engineers and of this Society, having been one of its founders in 1880. Mr. Sellers was granted about ninety United States patents, the earliest one having been in 1857, and some were pending at the time of his death. A great variety of subjects were covered, including machine tools, injectors, rifling machines, riveters, boilers, hydraulic machinery, furnaces, hoists, cranes, steam hammers, steam engines, ordnance, turn tables, pumps, etc. Probably the best known of his inventions is the spiral gear planer drive, in which the table is moved back and forth by a multi-thread screw on an inclined shaft engaging with a rack on the under surface of the table. In 1847 Mr. 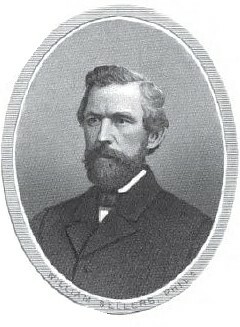 Sellers was elected a member of the Franklin Institute. He served as a member of the Board of Managers from 1857 to 1861 and again from 1864 to 1892. He served as president from 1864 to 1867. As chairman of a special committee of the Institute, he formulated a uniform system of screw threads which was presented to the Institute at a meeting on September 15th, 1864. This report was approved by the Institute, and within a few years was adopted by the Government in its workshops by the leading railroad companies, prominent machine tool builders and others, under the various names of the United States, Sellers, or Franklin Institute Systems. The leading difference between the Sellers and Whitworth forms lies in the angle of the thread and in the fact that it has a flat top and bottom instead of being round. In 1890 the Navy Department at Washington sent out specifications to machine tool builders for an eight-foot turning and boring lathe for sixteen-inch steel cannon. The main bed was nine feet wide and over seventy-three feet long, the extension bed for the boring arrangement was about fifty-three feet long and five feet wide, making a total length of over one hundred and twenty-eight feet. Mr. Sellers did not approve of the Government design and refused to bid, but he had a complete new design made, and convinced the Board of Engineers at Washington of the superiority of his design, which they adopted, discarding their own. Mr. Sellers received the contract for this lathe, which weighed about 500,000 pounds. In 1S60, during a visit to England, his attention was called to the Gifford injector for feeding steam boilers. The device was crude, but Mr. Sellers saw in it the elements of a novel principle. He secured the American rights and commenced the manufacture of these injectors, which he slightly modified, however. In 1865, after various improvements, he invented and patented the self adjusting combining tube which automatically adjusted the supply of water to meet the requirements of varying steam pressures. Further developments led to the most advanced and satisfactory forms of locomotive injectors. Mr. Sellers died January 24th, 1905, in the 81st year of his age.